Jerusalem, July 7, 2016 — The EDAB-FENS Brain Awareness Week Excellence Award for 2016 has been awarded to The Edmond and Lily Safra Center for Brain Sciences at The Hebrew University of Jerusalem. The Dana Foundation and the European Dana Alliance for the Brain (EDAB) presented the award in collaboration with the Federation of European Neuroscience Societies (FENS). Celebrating special contributions to the promotion of brain awareness through continued public outreach efforts, the Neuroscience Outreach Awards were presented at FENS Forum 2016, Europe’s pre-eminent neuroscience meeting, on July 4 in Copenhagen. Established in 2010, the Edmond and Lily Safra Center for Brain Sciences has a comprehensive and innovative research agenda that includes dialogue with the public. To this end, the Center initiated Art and the Brain Week, a series of lectures and cultural events including dance, art exhibitions and films that reveal the brain’s creative processes. Since 2011, Art and the Brain has reached more than 10,000 children and adults in Jerusalem and beyond, and thousands more through newspapers, radio and television. 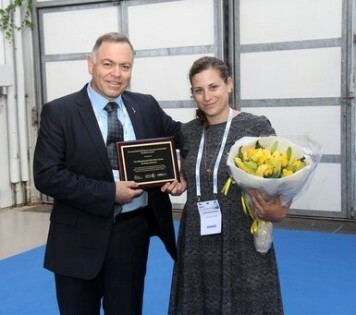 Dr. Rafi Aviram, Executive Director, and Ms. Alona Shani-Narkiss, Events and Publications Coordinator of the Edmond and Lily Safra Center for Brain Sciences, accepted the award in Copenhagen. Also honored at the awards ceremony was Prof. Paul Bolam, emeritus Senior Scientist at the MRC Brain Networks Dynamics Unit at the University of Oxford, who received the 2016 Dana/EDAB Neuroscience Outreach Champion award. The Edmond and Lily Safra Center for Brain Sciences (ELSC) was founded in 2010 with the support of the Edmond J. Safra Foundation, as an interdisciplinary center for brain sciences. The Center has an innovative and revolutionary research agenda for understanding the brain and its complex products: movement, perception, cognition, language, and creativity. Scientists at ELSC examine the brain from the level of the single neuron to complex human behavior using state-of-the-art scientific equipment and innovative research approaches: nanotechnologies, telemetry, and optogenetics. The unique integration of theoreticians with experimental researchers facilitates the simulation of brain activity using supercomputers utilizing mathematical and physical models to present the brain as an ever-changing, dynamic learning system. One important component of ELSC’s vision is to maintain a dialogue between scientists and the general public. ELSC seeks to reach out to those who are interested in the impacts of brain sciences research and are directly influenced by it. By holding public lectures and hosting temporary exhibitions on the brain, with informational handouts and joint “brainstorming,” the Edmond and Lily Safra Center for Brain Sciences renders brain research accessible to all who are interested. For more information, please visit http://elsc.huji.ac.il. The Hebrew University of Jerusalem is Israel’s leading university and premier research institution. Founded in 1918 by such innovative thinkers as Albert Einstein, Martin Buber and Sigmund Freud, the Hebrew University is a pluralistic institution where science and knowledge are advanced for the benefit of humankind. The Hebrew University is ranked internationally among the top 100 universities in the world, and first among Israeli universities. Serving 23,500 students from 85 countries, the Hebrew University produces a third of Israel’s civilian research, and its faculty are at the forefront of the international academic and scientific communities. For more information, please visit http://new.huji.ac.il/en.